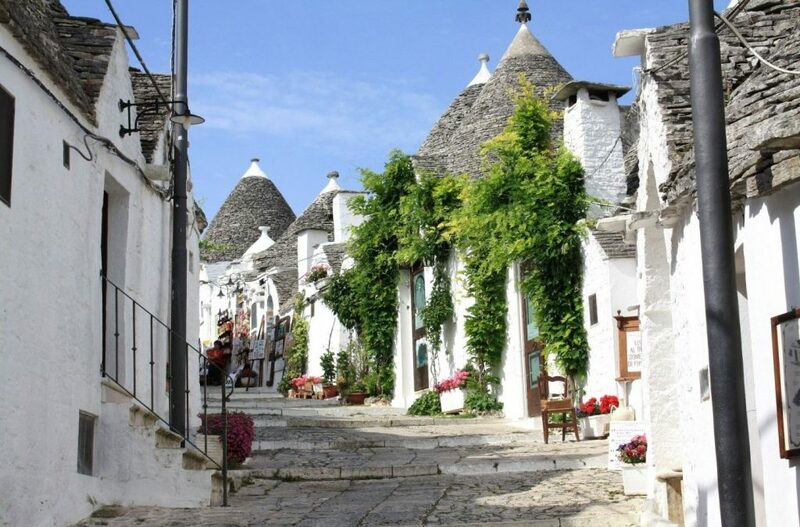 A trip that will unveil you the 2 “jewels” in the Itria Valley (Valle d’Itria) Alberobello and Locorotondo. The Historic Center of Alberobello is one of the UNESCO WORLD HERITAGE SITES thanks to his Trulli (traditional drystone huts) (more than 1.400): a unique example of architecture that uses drystone walling construction (made without mortar) for their unusual conical roof that still survive and are in use today since past centuries. Many of them are still used as homes meanwhile other as Restaurants, shops, or small accommodations. A tour where you can discover the story of the Trulli, their architecture, the mysteries and the decorations present on the keystones. During our tour we will visit two of the oldest neighborhoods: Aia Piccola and Monti. It’s also possible to visit the Trullo Sovrano (National monument), today hosting a museum that will help us understand their way of living back days and the furnishing inside a typical Trullo. Locorotondo received the Orange Flag award (as a recognition for the quality and beauty of its territory) from the Italian Touring Club. It is also possible to extend or modify our tour, with a pit stop to a local restaurant, take cooking lessons, visit local companies and do some wine tasting, extra virgin olive oil tasting, cheese tasting, capocollo salami from Martina Franca, Biscotto from Ceglie ( Ceglie Biscuits) any many other local products, a tour guide to Martina Franca, Cisternino, Castellana Grotte, Noci, Ceglie, Messapica, Ostuni, and many others.